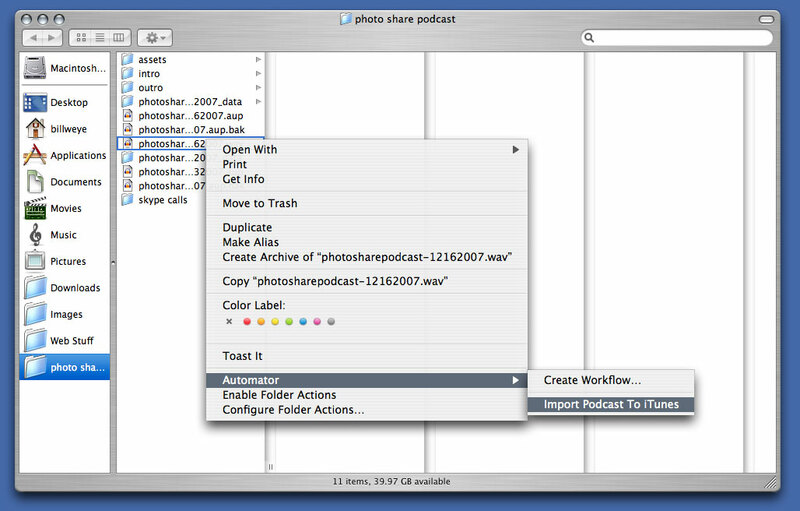 Would you like to encode your podcast file to mp3 and fill-in the ID3 tags with just one right mouse click? Then this tip is for you. To brand your podcast effectively, consistent ID3 tags and file encoding is important; you want your listeners or viewers to feel like you’re dependable, that your podcast will show up on the same day every week and that it’ll be in the same format every time. This tip will show you both how to get that consistency and speed up the time it takes you to prepare your podcast file for upload. Unfortunately I’m only going to explain how to do this on Mac OS X, but I’m sure the same concepts probably apply to Windows. 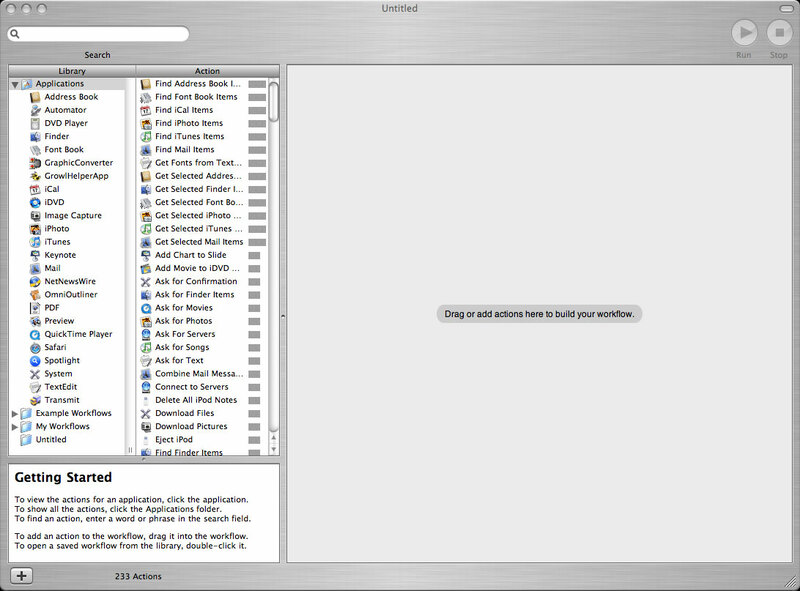 The program we’re going to use is called Automator, which can be found in your applications directory. This underrated, unused program is very powerful. Look at the screen shot on the right; on the left you can see all the programs Automator can control, and each has some pre-made actions so you don’t have to create any. Let’s assume you’re starting with a lossless file like wav, which you would export from a program like Audacity or Garageband. You then want to import that file into iTunes for conversion to an mp3 file. 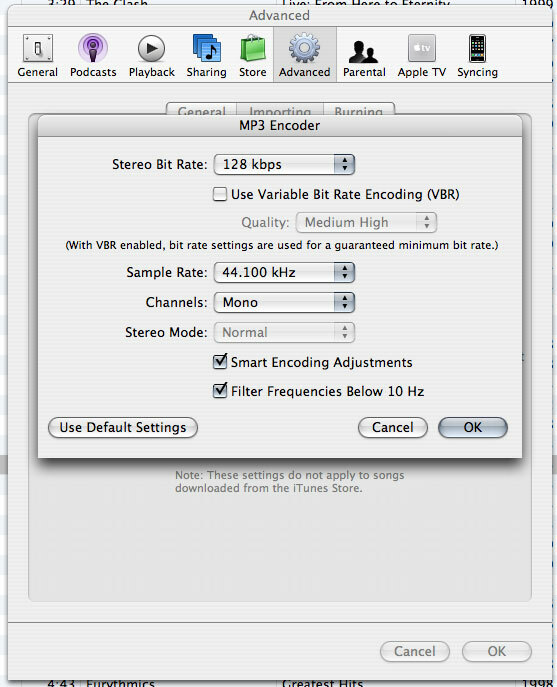 Before you begin importing the wav file, open iTunes so you can set the default preferences for encoding an mp3. It’s these are default settings that your Automator action will use. Look at the screen capture to the left and you’ll see my default settings; notice that the setting is for 128 kbps stereo, but the file is encoded mono, therefore the file encoding is half of 128 (64 kbps). Always make the sample rate 44.100 kHz. Save those settings. You’re now ready to create your Automator action. 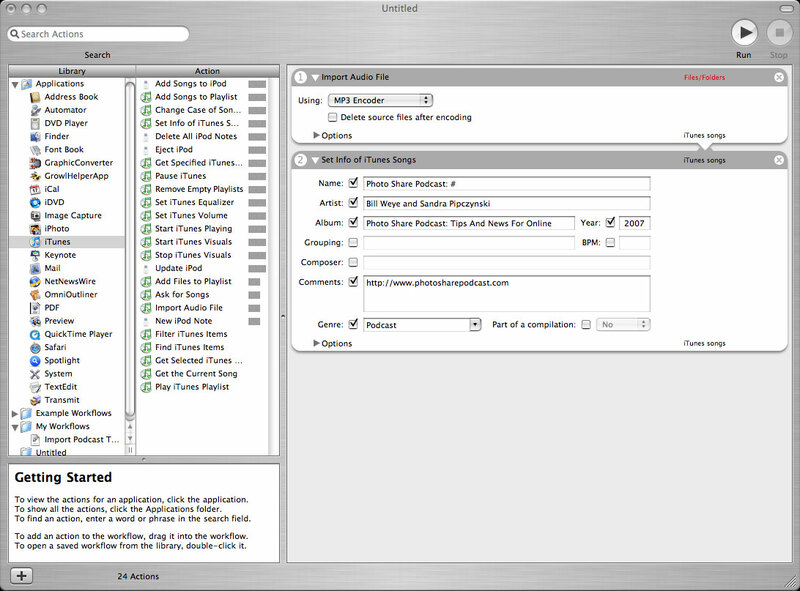 On this screen shot you can see all of the pre-made actions associated with the iTunes application. There’s quite a few there, but we’ll only be using two of the actions. If you’re interested, highlight each of the actions and read the help pane on the bottom left of the window. 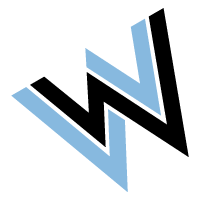 I want to take a moment to reassure you that making a mistake with this program will not ruin your computer, that you should poke around and create some actions that might help automate repetitive tasks. If an action doesn’t work, open Automator and delete the action, then start over. It’s that simple to fix a problem. On this screen shot you’ll notice that I added two actions by dragging and dropping them: “import audio file” and “set info of iTunes songs”. It’s important that you put these actions in the correct order; the ID3 tags (the mp3 file info) needs to be set after the file is created. With the import audio file action choose to import with the mp3 encoder (that will use the preferences you previously set). Setting the info for the mp3 file is a little more complicated. You can see how I use the various fields, which works for me. Also, notice that I leave the show number blank; I can’t fill that in until each file is encoded because I’ll use this same action again next week. When you’ve finished customizing your action you’ll want to save it. Go to the File menu and choose Save As Plug-in, then from there you want to save it as a plug-in for Finder. You’re done. 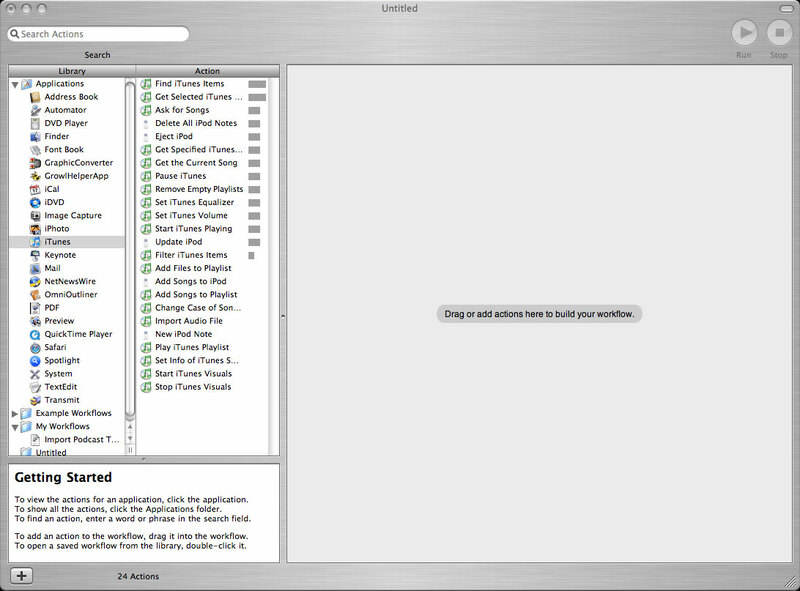 Quit Automator. Now, let’s find your wave file and apply the action you just created. Right mouse click on the wave file, on the bottom of the menu, you’ll find Automator; under that you’ll see the action you created (I named mine Import Podcast To iTunes). Release the mouse button after selecting the action, then watch the magic! Don’t forget to finish numbering your podcast. Applying this and other Automator work flows into your daily routine has the potential to save a lot of time in a week. Go on, create a new work flow and tell us about it! If you found this article useful, please consider subscribing to the Netcast Blog Feed. I have been struggling with Automator and Audacity to streamline my encoding process without much success. I will give this a shot. 1: I don’t like having to set the podcast encoding rate each time I use it, then set it back to my usual settings for importing CDs when done. 2: I also don’t like having my podcast files end up in the iTunes directory. I would prefer them to end up in the same directory beside the original file. Could all of this be automated in the same workflow? That would make it closer to a one-click solution.